This product has been replaced by the Super Empire Builder (SEB) and is no longer available. Click here to view the SEB. Empire Builder II was the second generation of the Empire Builder starter set. It contained a DB150 Command Station/Booster and LT1 Tester. It featured the new DT300 throttle and contained a UP3 universal panel. The set also included a premium decoder in N, HO, or G scales. The Empire Builder II was also available in a Simplex Radio Equipped version. Run up to 22 locos and 22 throttles in command station mode. Dual click encoder throttles offer the finest speed control available. 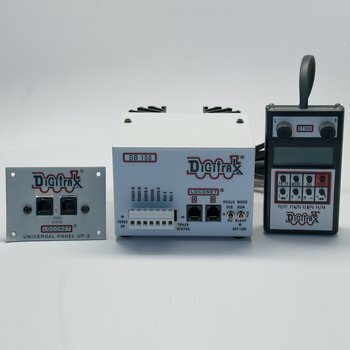 The encoders can also be used to select loco addresses to run and to reverse the loco controlled by the throttle knob by double clicking the knob. Multi-line backlit LCD display lets you see loco address, speed, direction, function status and more by simply glancing at your throttle! Four digit operation is really simple! Access to functions 0 through 8. Access to switch control for controlling turnouts and other layout animation. Universal Consisting, Advanced Consisting & Basic consisting. 2 digit & 4 digit addressing. Program decoders from your DT300. No battery required when operating in the tethered walkaround mode. Infra-ready! Just add UR90s for tetherless operation.